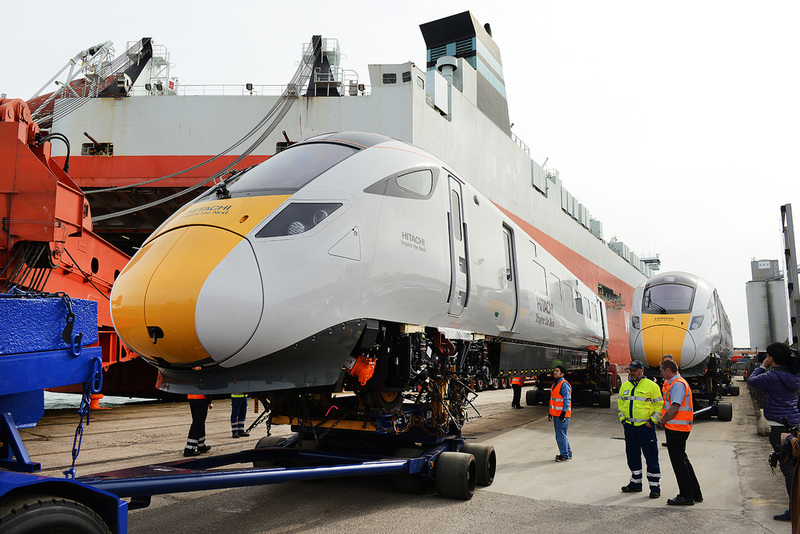 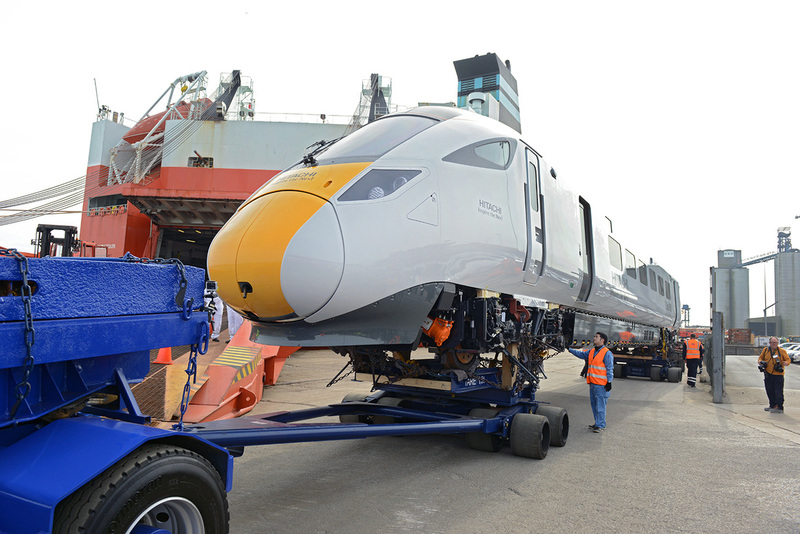 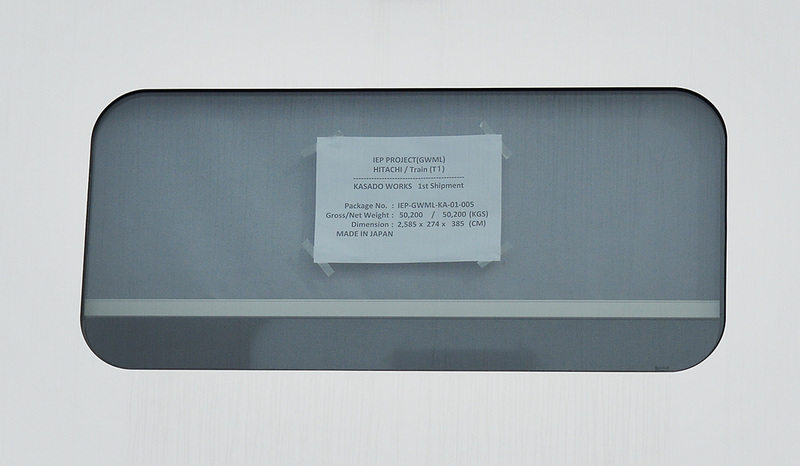 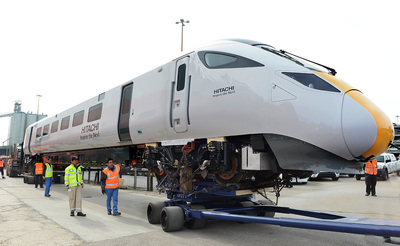 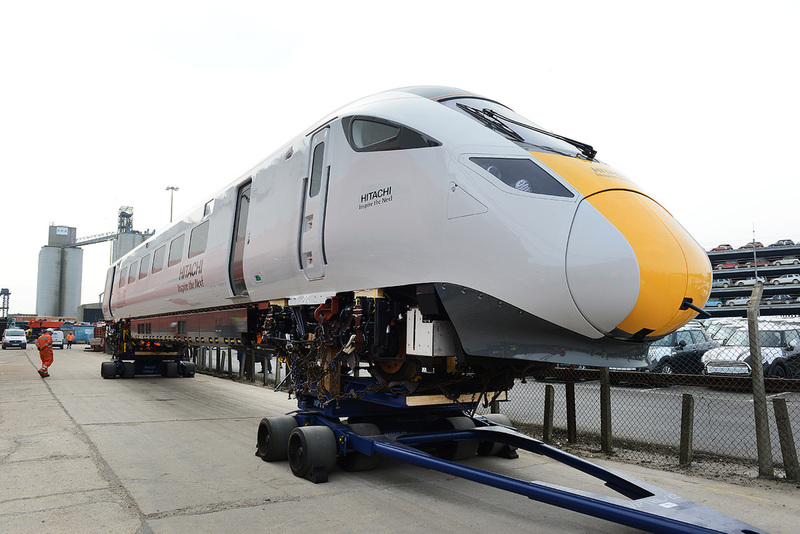 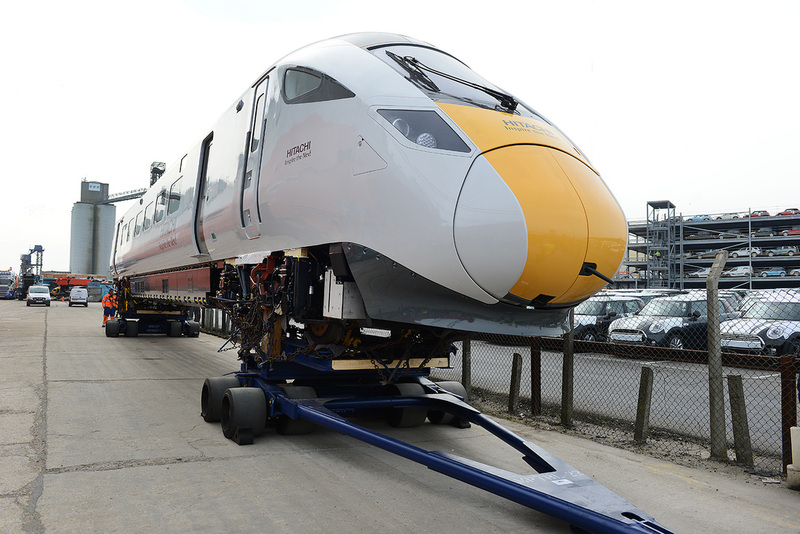 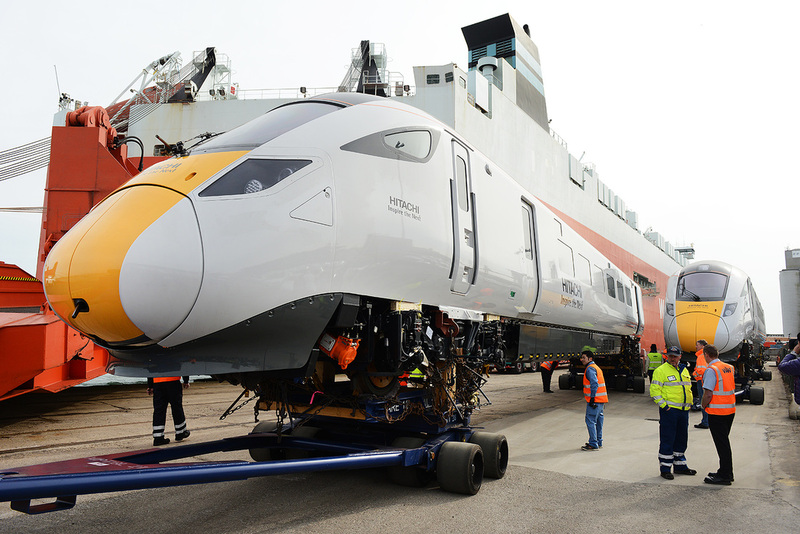 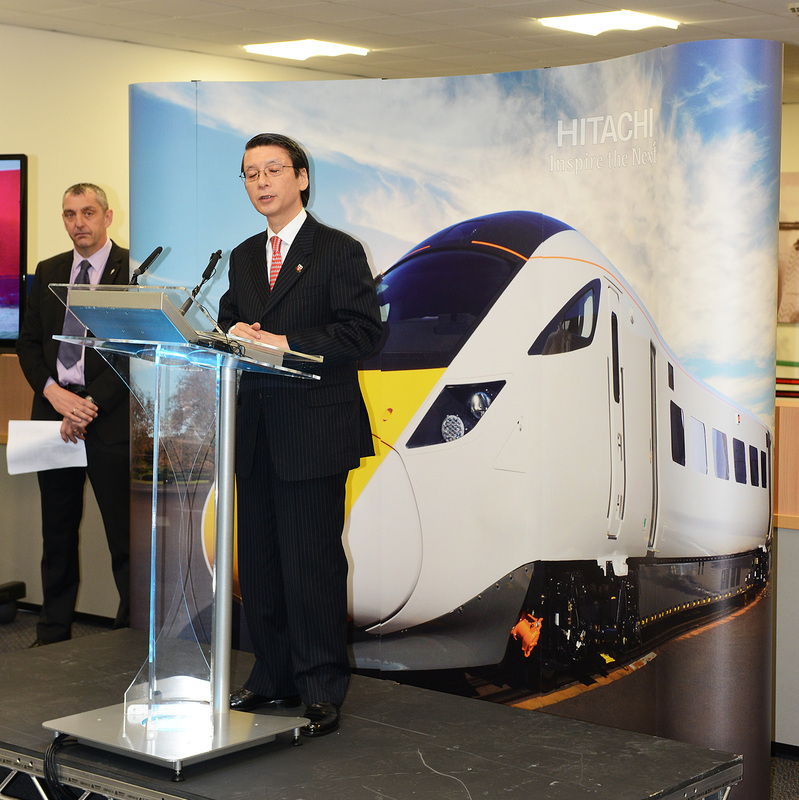 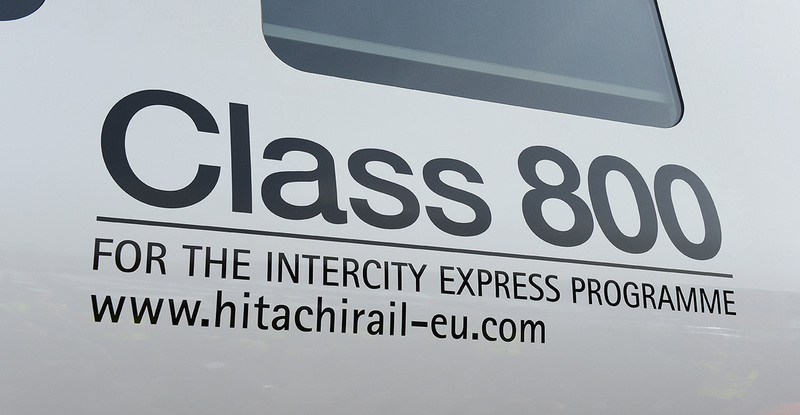 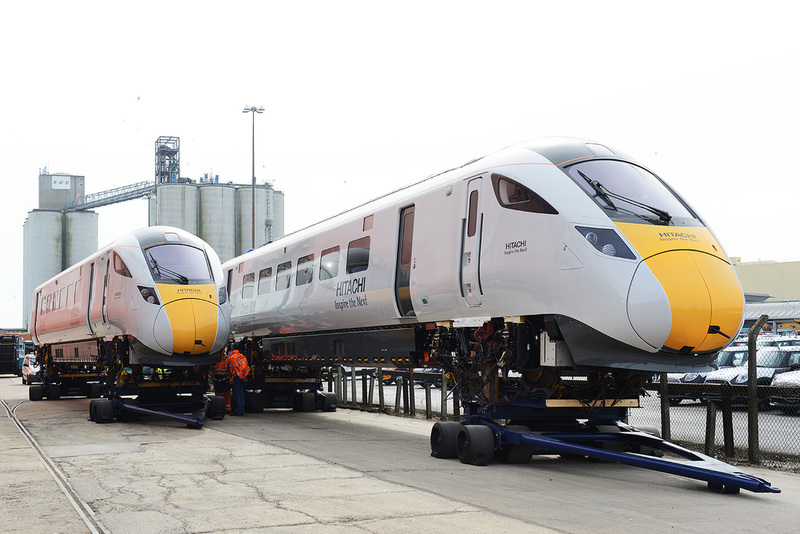 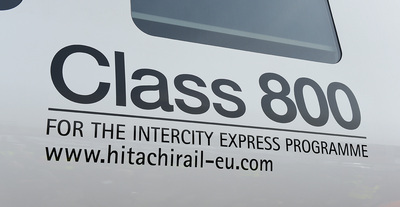 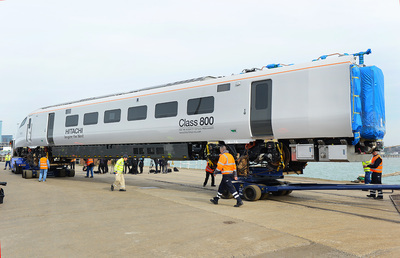 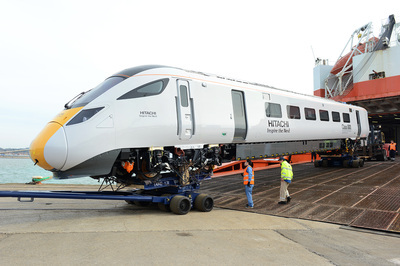 The first pre-production five-car bi-mode Class 800 Intercity Express Programme train No. 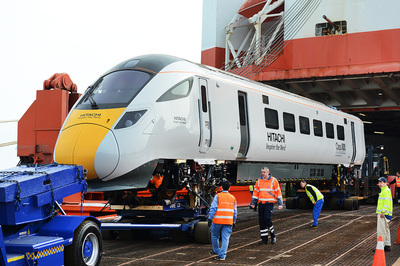 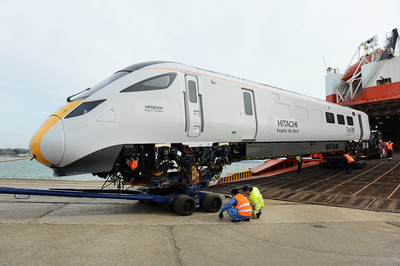 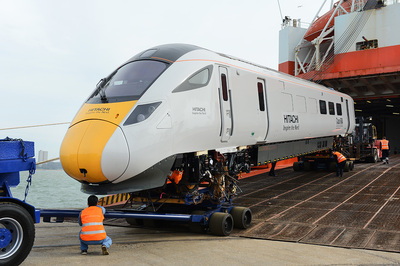 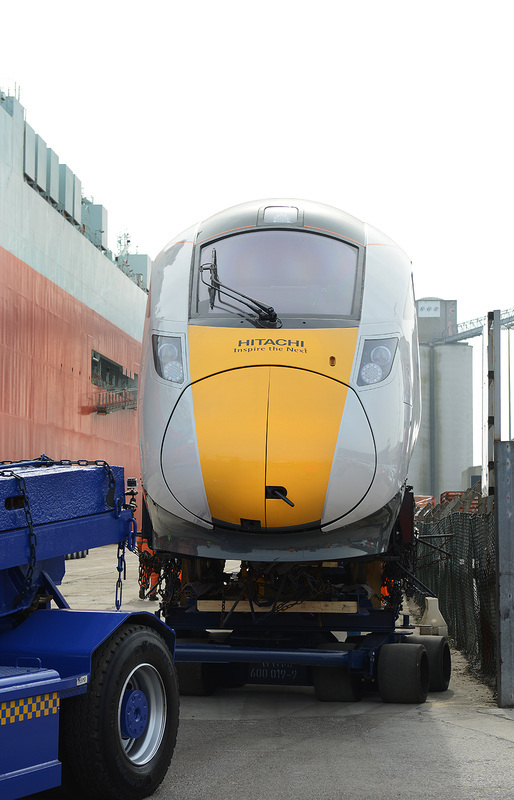 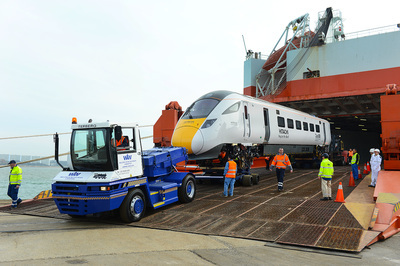 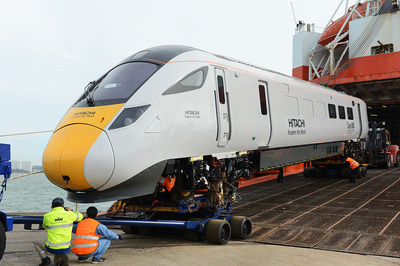 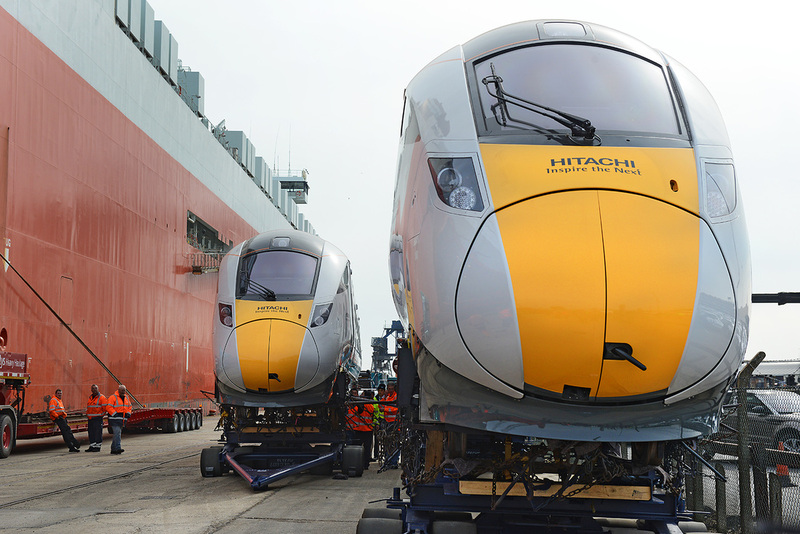 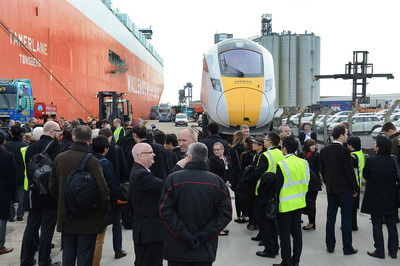 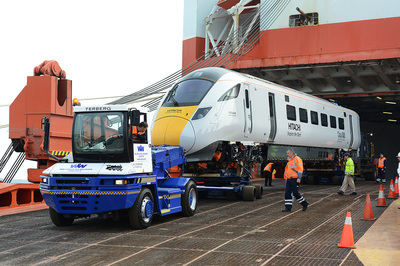 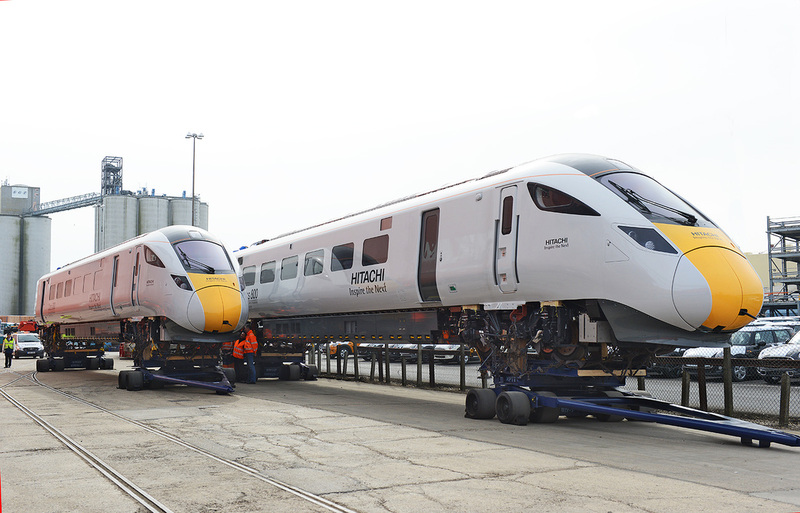 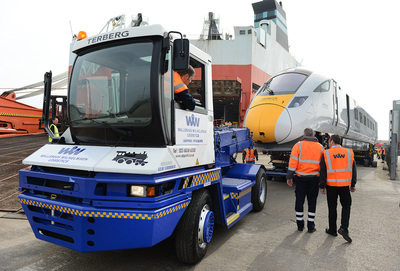 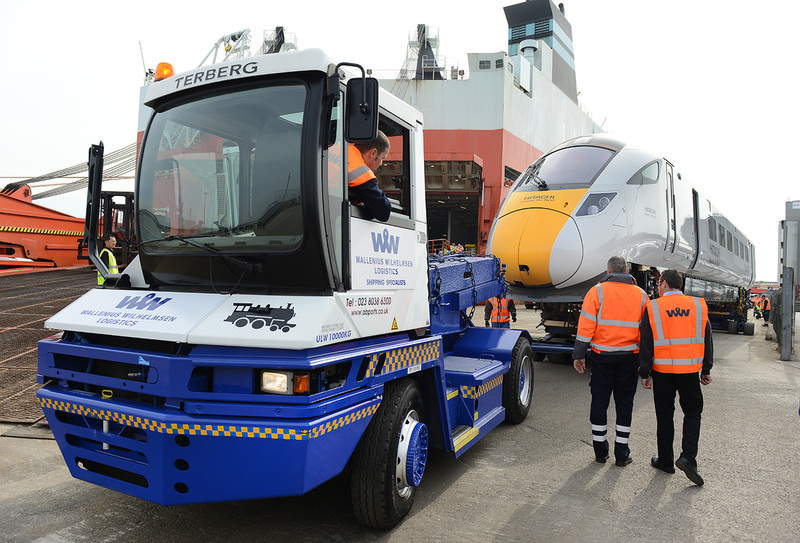 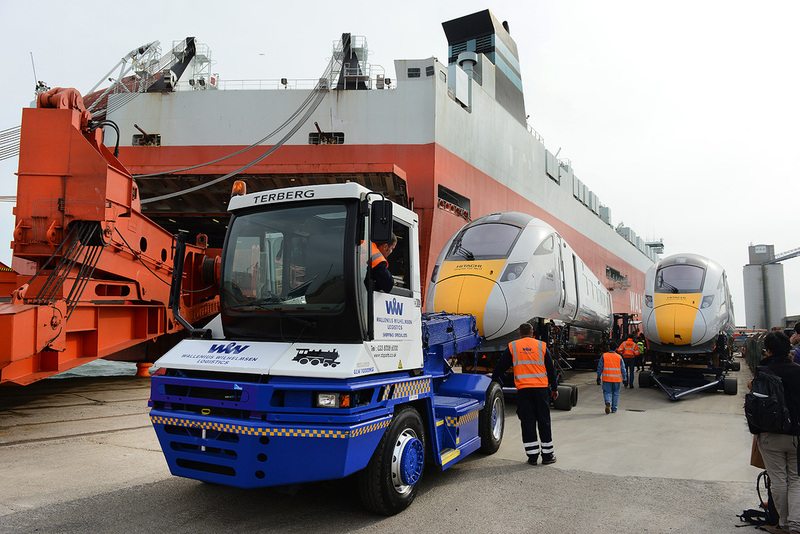 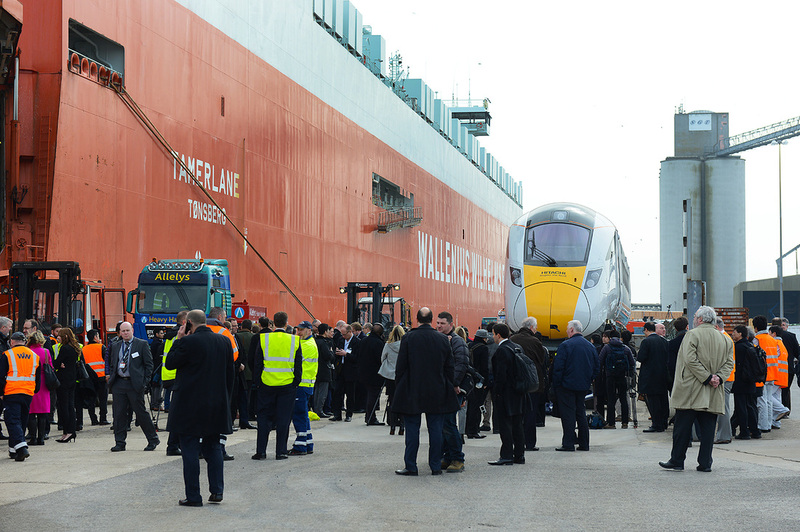 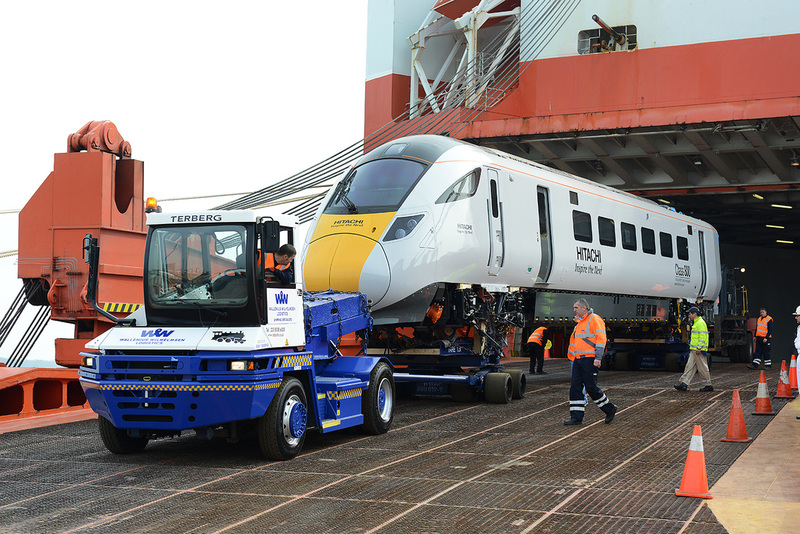 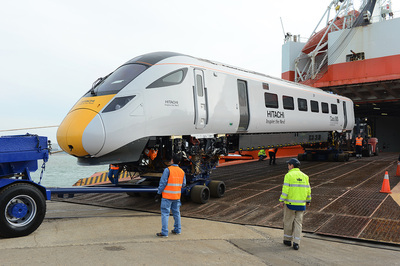 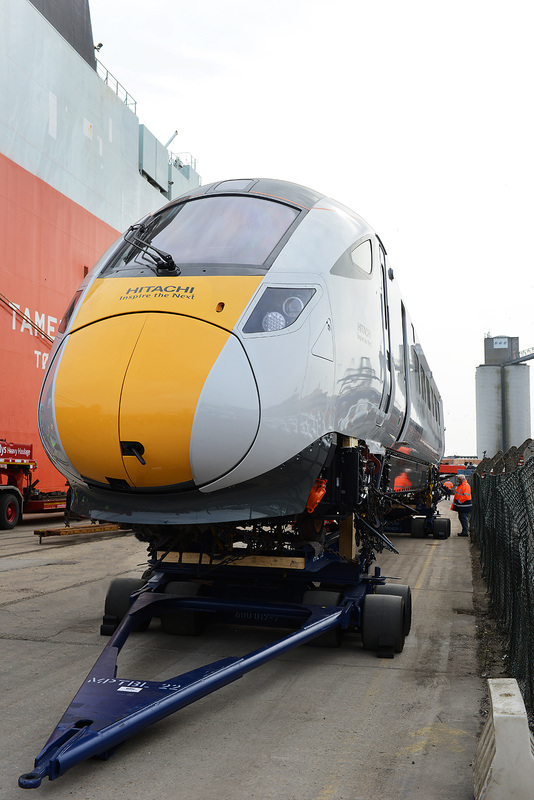 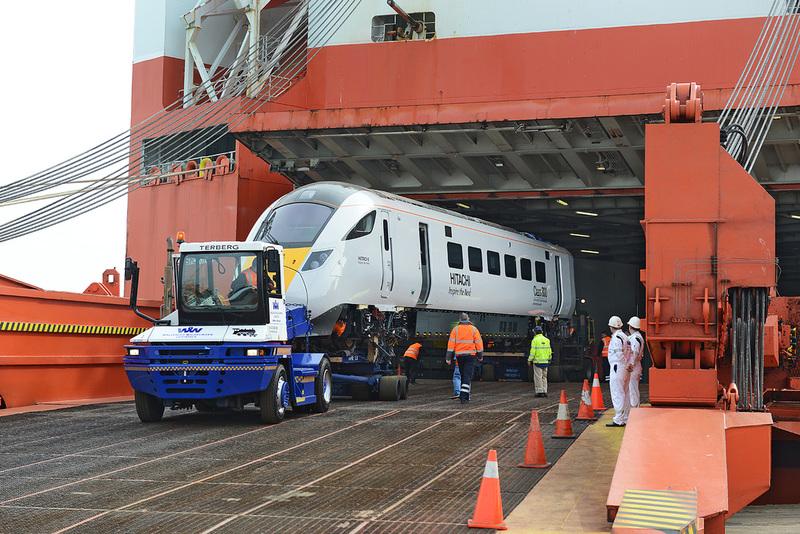 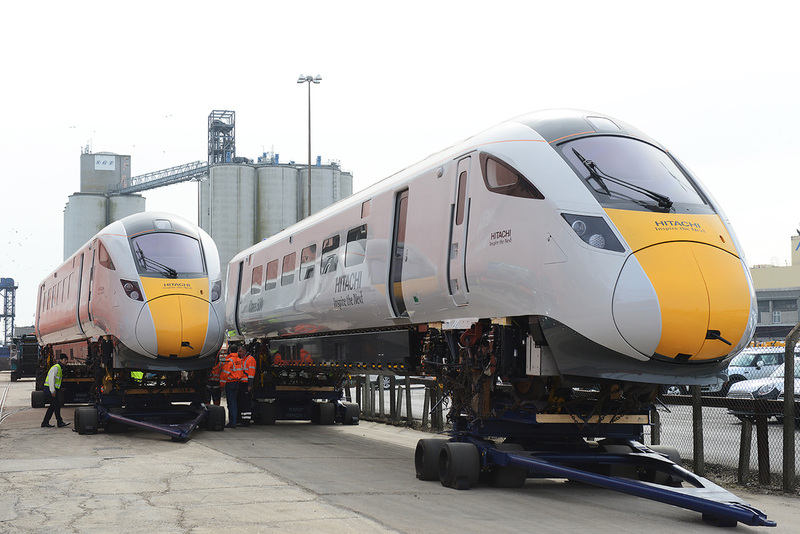 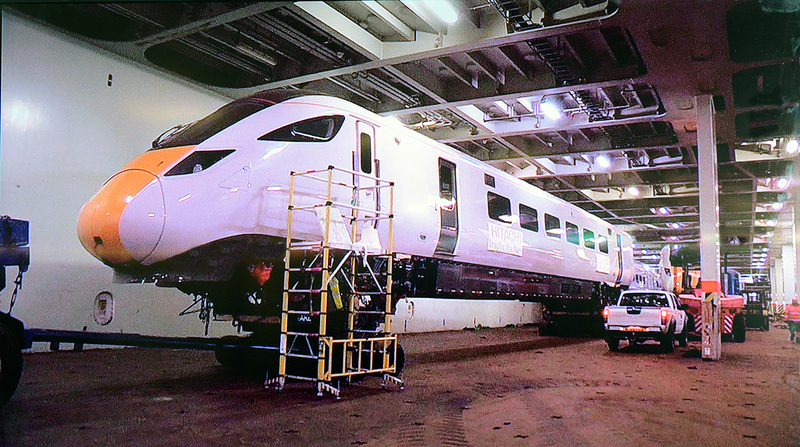 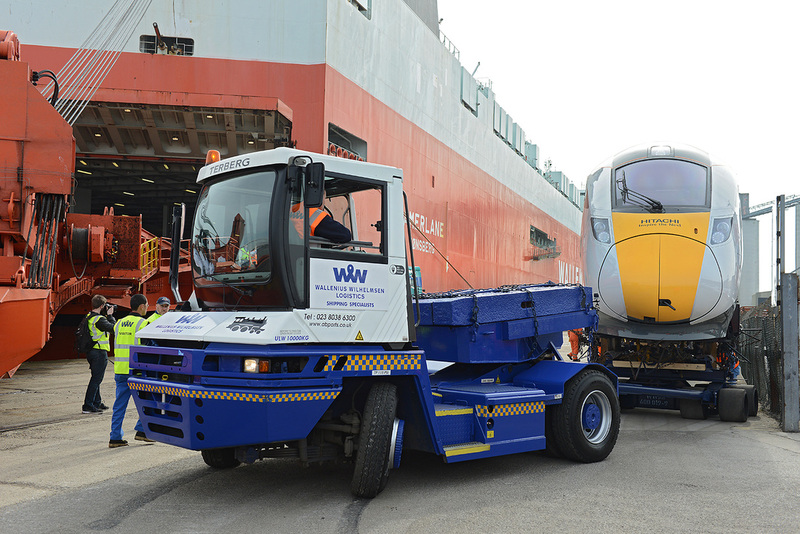 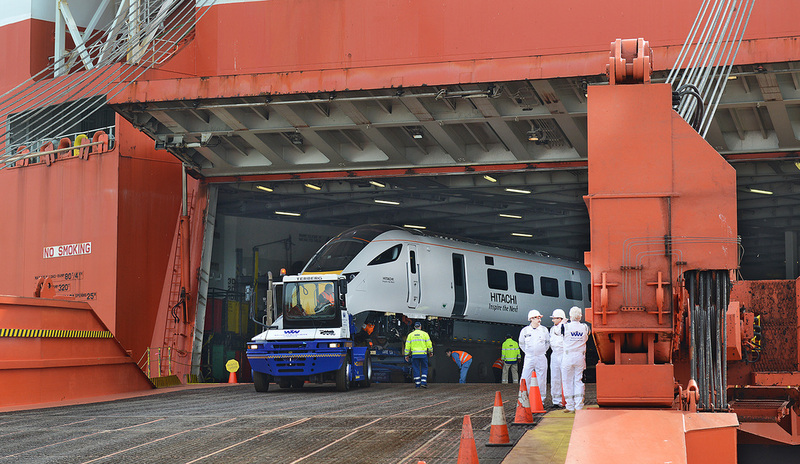 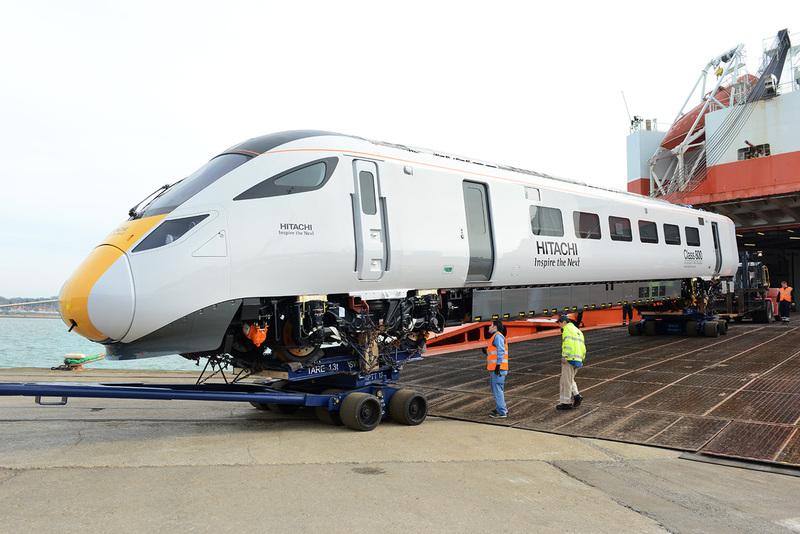 800001 arrived at the Port of Southampton on 11 March 2015 and was unloaded on 12 March. 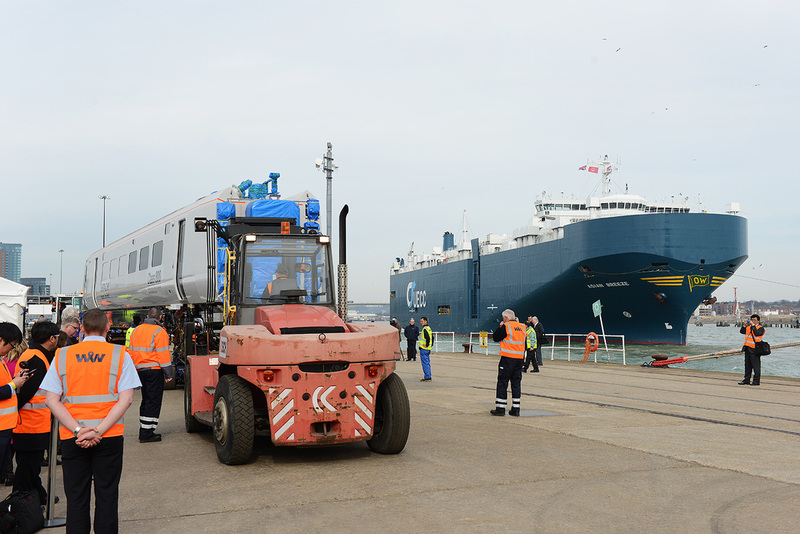 The five vehicles were shipped from the Hitachi factory in Kasado, Japan on 7 January 2015 and were transferred to the 67,140 ton Wallenius Wilhelmsen Ro-Ro ship MV Tamerlane at the port of Kobe, Japan on 22/23 January 2015. The ship then travelled via the Panama Canal and the US to Southampton. 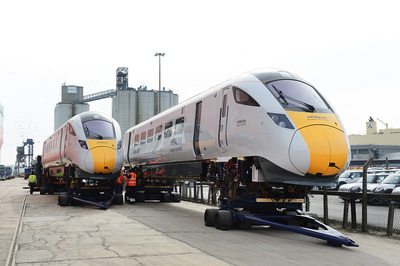 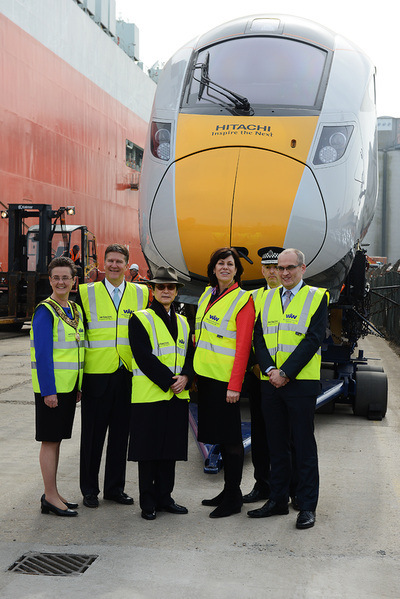 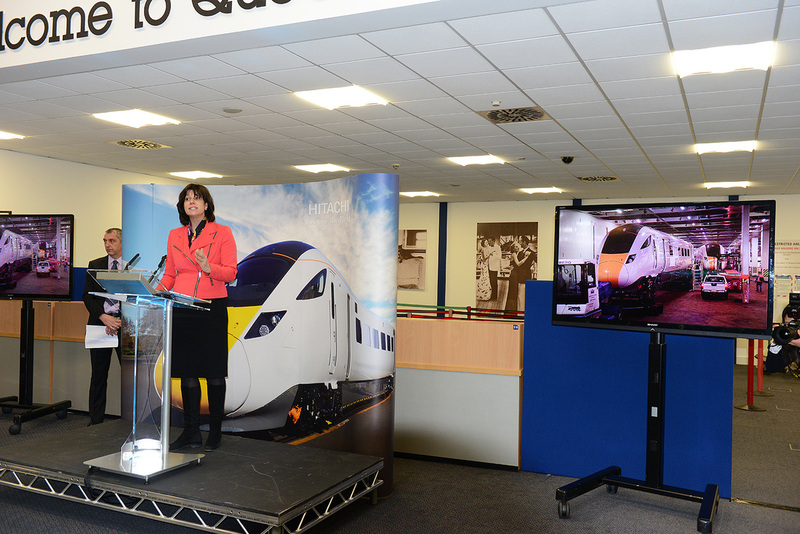 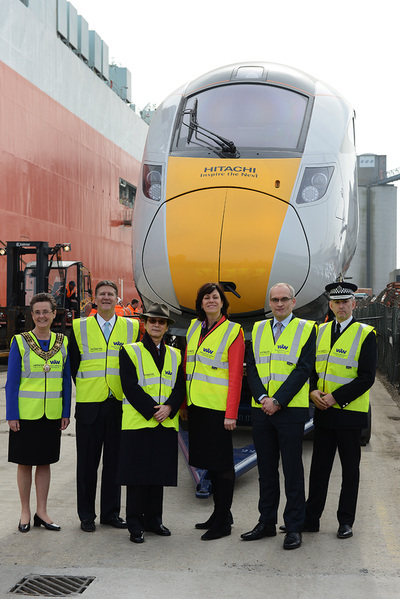 In front of guests including the Transport Minister Claire Perry, the two driving vehicles were off-loaded for a special photo call before all five vehicles were taken by road by Allelys Heavy Haul to Old Dalby for commissioning and testing, before starting main line testing in the summer on the East Coast Main Line. Vehicle No. 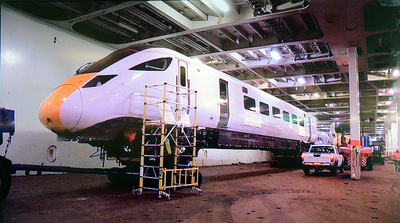 811001 a Driving Pantograph Trailer Standard (DPTS) was first off the ship and is seen being carefully moved from ship to dry land in the first illustrations, this was followed by Driving Pantograph Trailer First (DPTF) No. 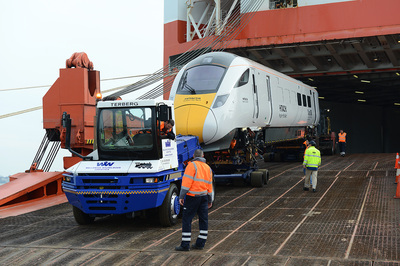 815001.